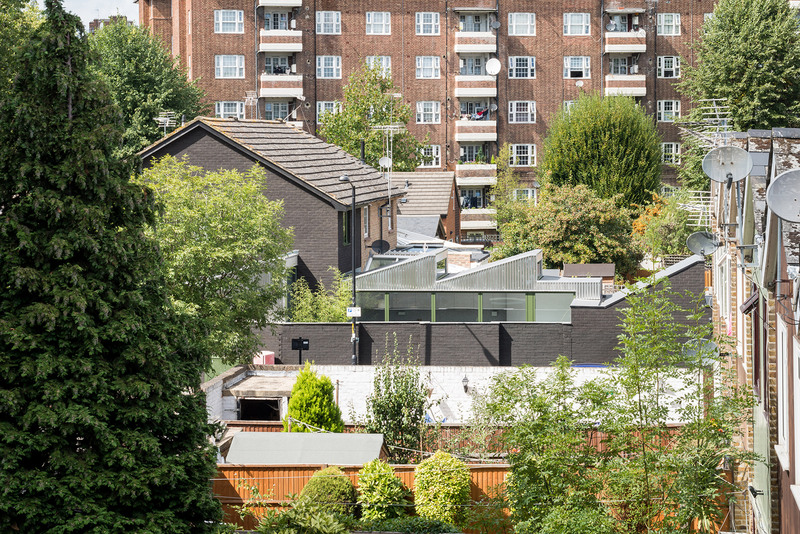 Archmongers has turned a section of walled garden in a 1980s house in south London into a living space with sawtooth roof, earning it the dinosaur-inspired name Stego. London-based architectural studio Archmongers, headed by architects Margaret Bursa and Johan Hybschmann, refurbished the house in Kennington to create a more practical layout. The end-of-terrace property had two bedrooms upstairs and a cramped ground floor containing all of the living areas. It also featured a freestanding garage with its own access. 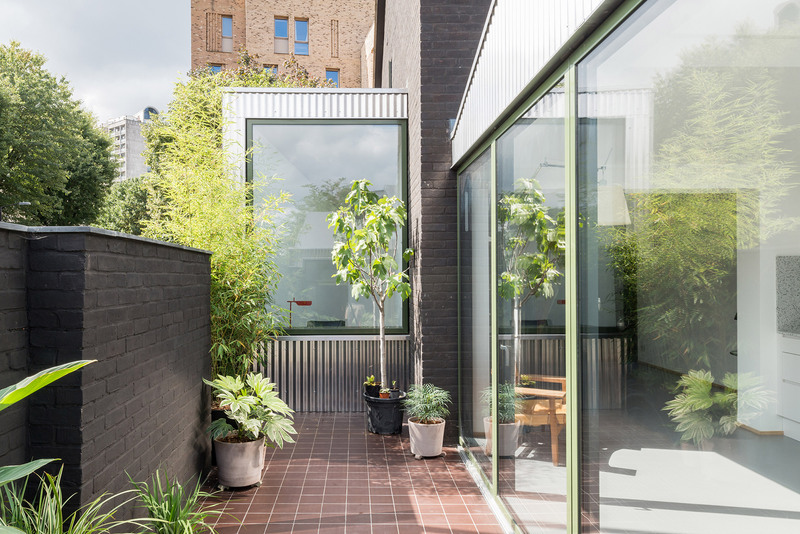 Archmongers opened up the ground floor by adding a single-storey extension that occupies part of the house’s underused walled courtyard garden. 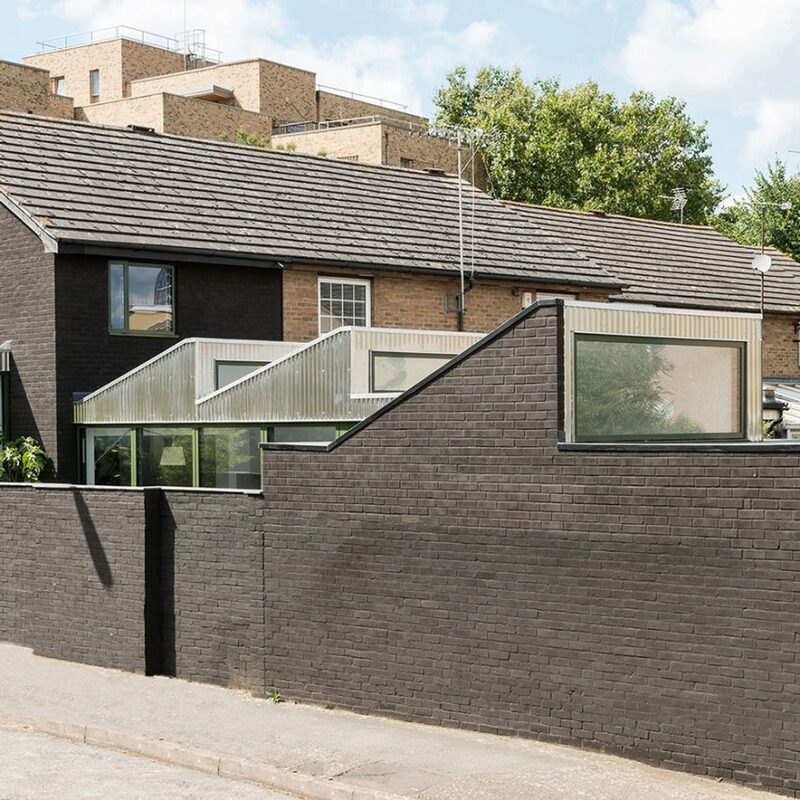 The extension connects the existing house with the converted garage and is topped with a saw-tooth roof that is visible above the outer wall. The vertical protrusions evoke the plates on the back of a stegosaurus, which gave the project the name Stego. The house’s brick facades and boundary wall are treated with a dark stain to distinguish it from the rest of the terrace and ensure the old and new sections have a unified appearance. 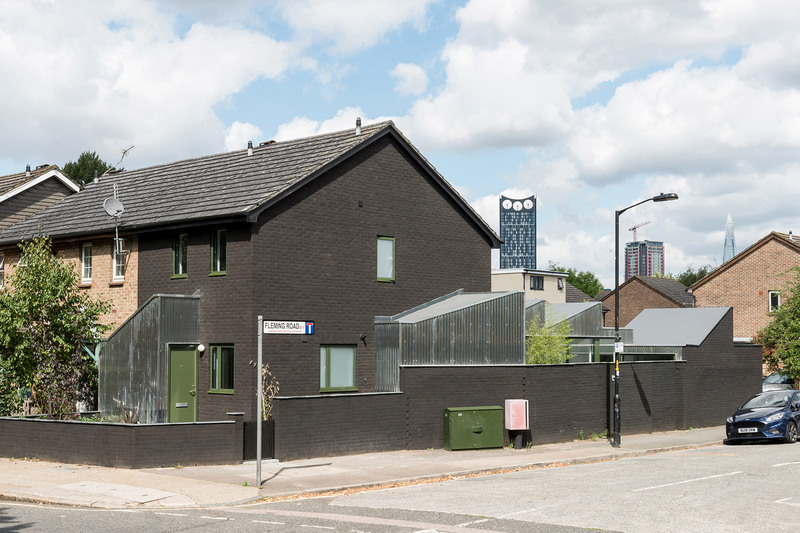 “The planning authorities were very supportive and were happy to see something that was convincing and gave this type of property some real character,” Bursa told Dezeen. Stego also involved updating the building’s exterior by replacing an existing wooden porch with a new addition that breaks up the facade and provided much-needed storage space. This porch also contributes to the reorientation of the house towards the side road and forms a visual connection between the front of the building and the other extensions. 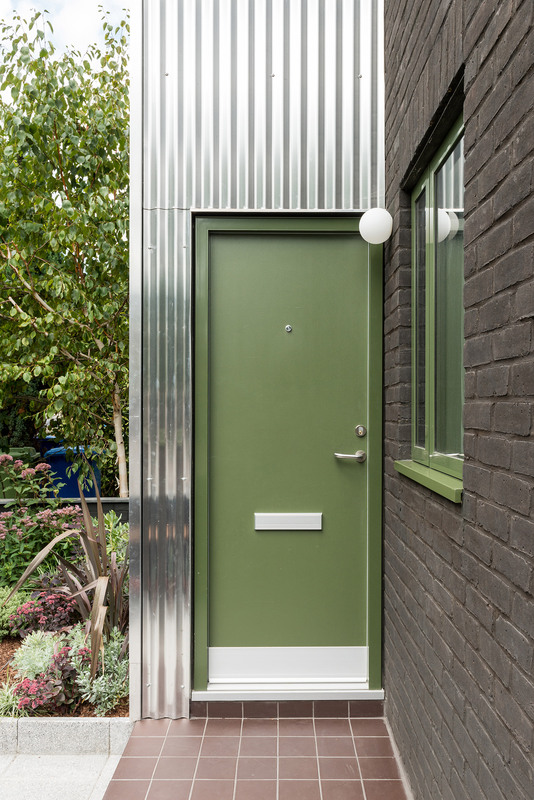 These new additions, including a small side extension containing a study, are clad in corrugated aluminium that contrasts with the brick surfaces and changes with the light. “Because the area is hugely varied in terms of architectural styles and eras, we wanted to use something to reflect some of the textures and colours of the surroundings,” Bursa explained. Previous projects from Archmongers include the extension of a house in north London featuring built-in furniture inspired by canal boat interiors and the colourful makeover of an ex-council house. Corrugated aluminium was also chosen because it is easy and cost-effective to install, as well as being hard-wearing and low maintenance. The new porch leads to an entrance hall containing a staircase with built-in storage underneath. 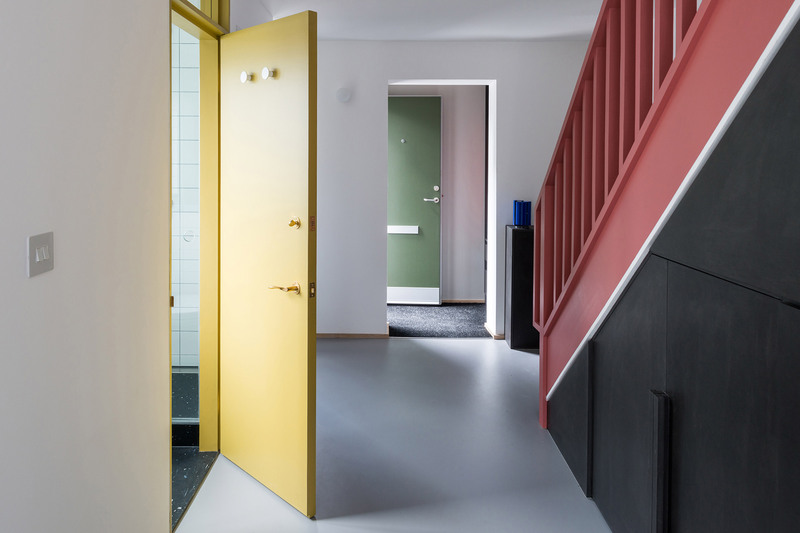 A toilet was added opposite the stairs and the compact study is squeezed into an angular space between the existing facade and the boundary wall. 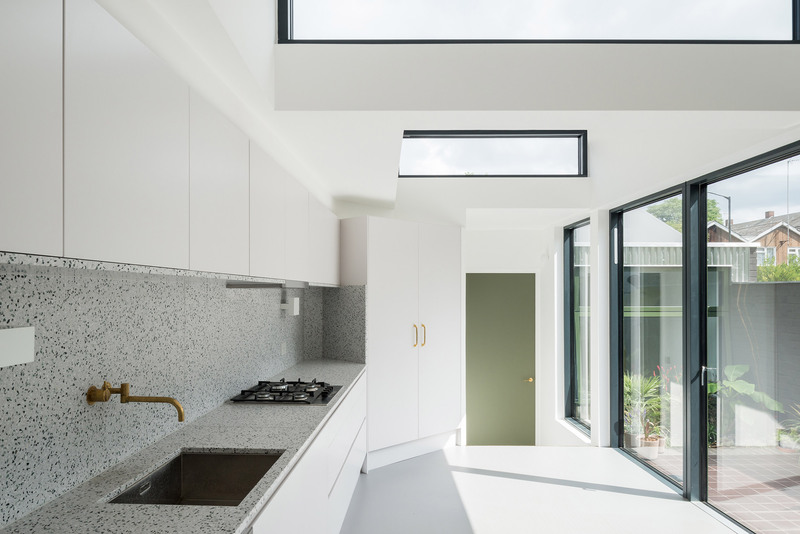 The Stego extension contains a terrazzo-lined kitchen and dining room that receives natural light from a series of clerestory windows. Sliding glass doors lining the space connect it with the remodelled courtyard. “The development of the site takes a small garden that was hardly used and reduces it to an even smaller garden that makes far superior use of the available footprint,” the architect added. The owner lived in various countries during her early life, including some with tropical climates, so the design aims to capture some of the characteristics she most enjoyed about her former lifestyle. “She loves warm weather and light so we tried to use the courtyard to create an internal landscape lined with glazing that brings in plenty of sunshine,” said Bursa. Tropical plants incorporated into the garden evoke the client’s childhood. 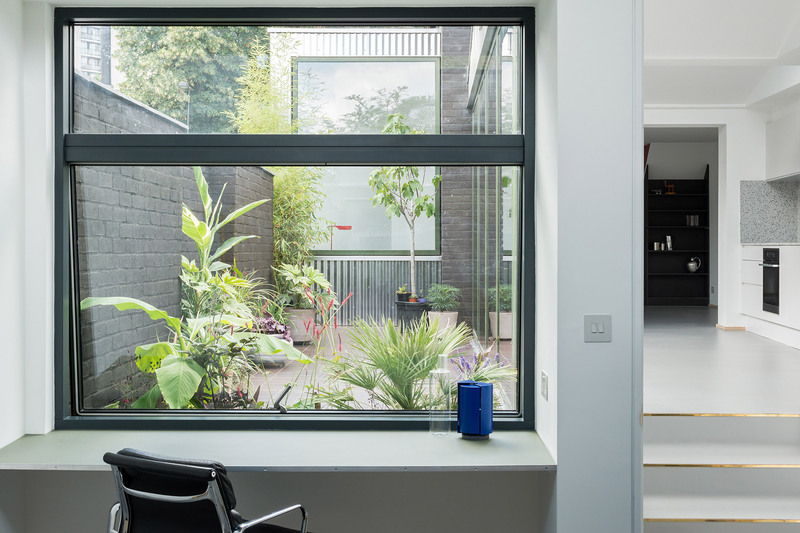 There are views of greenery from all the new spaces, including through a large window in the study that looks beyond the garden towards the rooftops and sky. Archmongers positioned a sunken planter next to steps at the end of the kitchen that mark the transition between the living area and the bedroom. The change in level creates a different horizon that accentuates the separation between the different spaces. Stego, which was awarded second prize in Don’t Move, Improve Awards! 2019, isn’t the only London extension inspired by an animal. 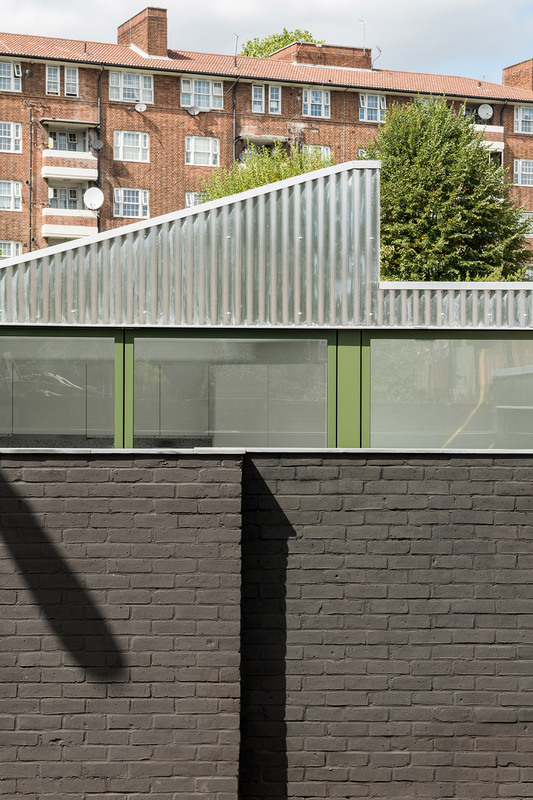 David Kohn Architects designed an addition to a property in north London that resembles a fox. The post Stego extension by Archmongers features a sawtooth roof made from corrugated aluminium appeared first on Dezeen.